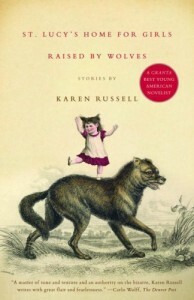 Title story from St. Lucy’s Home for Girls Raised by Wolves by Karen Russell, published 2007. I’ve recently been making a point of reading more short stories because I’m interested in trying my hand at writing some. As I’ve read more, I’ve discovered that there are certain genres that seem to excel in a shorter form. There’s a vaguely defined genre known as “slipstream” – sort of an odder cousin to magical realism, perhaps – that seems perfectly suited to short stories. To me, slipstream refers to stories that are just to the left of realism, ones with a slight surrealistic tilt, usually just enough to make you feel slightly uncomfortable. Karen Russell seems to fit nicely into that category. I’d heard of her previously after reading some interesting blurbs about her first novel, Swamplandia! (exclamation point included), and both of her books have particularly eye-catching cover designs. I stopped at the library on my way home today to see if they had anything of hers on hand. They didn’t have the full collection, but I was able to find this story in a Best of 2007 collection edited by Stephen King. At the start of the story, we discover that there are special schools for children born of werewolves. The condition skips a generation – alternating between wolfishness and humanity – and most werewolf parents feel it best that their more human children be taught the ways of humanity so that they can exist properly in both worlds. The story is narrated by a girl named Claudette as she experiences the different stages of becoming acclimated to human society. The story works on several levels; when the girls are first brought to the school, they are given human names, much like missionaries gave “Christian” names to natives in Africa. A theme running throughout is what it really means to be “civilized” and how losing touch with nature changes someone. The youngest sister of the bunch never lets go of her animal nature, and she is shunned by the others for not conforming. The question of how to handle this ever-present reminder of their former wild nature is always at the front of the narrator’s mind. On another level, the story works as a commentary on gender roles; there is a separate school for boys, and when the two groups are reintroduced to each other, they are told to speak in carefully prepared human dialogues. When one of the boys goes off script, Claudette snaps and lets her wolfish nature come through, and the boy is shocked and unable to respond. The girls are taught to control their emotions and behaviors very carefully, and the stress of that repression clearly wears thin. Ultimately the story is a fascinating dissection of civilized society and the roles that are imposed on us as we grow up. The setting is evocative, the characters are nicely drawn, and it’s a brisk, easy read. I look forward to reading more stories by this author. Definitely recommended.